I am pleased to announce that one of my multilayered beads has been juried into the Surface exhibit, to be shown at the Bead & Button Show in June. When I read the call for entries, I thought it seemed written for these beads. "ISGB invites its members to create a bead that answers one of two questions: What lies beneath? When is it actually what is on the outside that counts?" 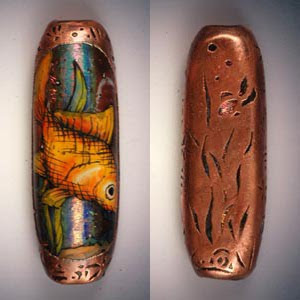 Koi Pond is an electroformed enamel bead, with multiple layers of hand-painted enamel and a wrap of carved copper. I drew the black outlines for the fish onto a flat tile of clear glass with finely ground glass mixed with oil. I did the same for a second, smaller tile of glass, drawing water grasses, sand, a snail, etc. Both pieces were kiln-fired to make the enamel permanent. I painted colored enamel onto the tiles in reverse (the enamel is buried under the clear glass in the finished bead) and then fired again. To a base bead constructed on a mandrel with a lampworking torch, I added a wrap of dichroic (metal-covered) glass for a little sparkle in the depths. Next I wrapped the grass tile around the bead. Finally I wrapped the fish tile around the bead, then heated the bead to flatten and shape it. The bead cooled slowly overnight in my kiln to remove stresses and enhance durability. I added a coat of conductive paint to the bead. Suspended in a vat of acid solution, copper was electrically moved from a sheet of metal to the surface of the bead. After many hours of deposition, the bead was rinsed, polished and patinaed.